ぽかぽかと暖かな日差しが感じられる季節になりました! お店では、新しい PonoLipo Style の配布を開始しました♪ 今回は、イースターのクラフト Work Shop や春の絵本、またゴールデンウィークに店頭で開催するプチマルシェに関するお知らせなど、さまざまなイベントの情報が載っていますよ! It’s beginning to feel like spring! The latest version of our “PonoLipo Style” newsletter is available for free at our store. 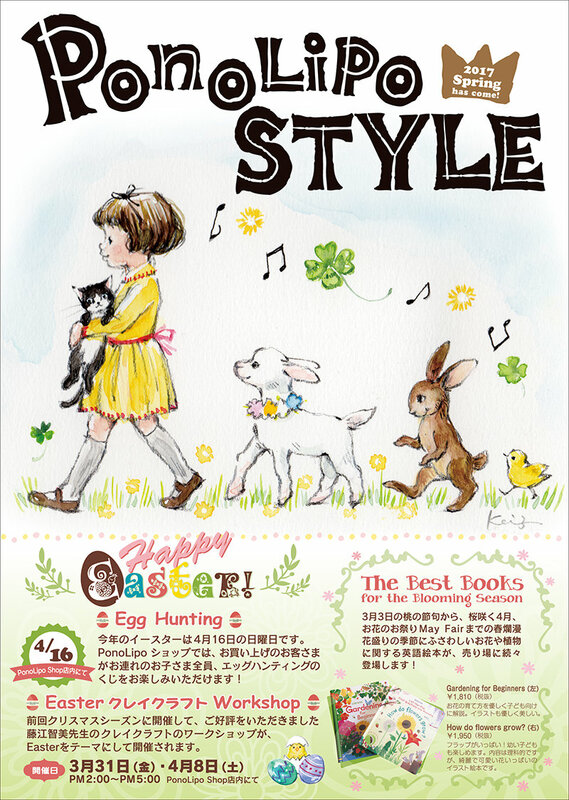 The newsletter contains information about our Easter craft workshops, the new seasonal picture books we have in stock, and an event we will have planned at our shop during Golden Week. Please come by our shop to get your copy fresh off the press! You can find more information on the latest “PonoLipo Style” newsletter.